We went to the first actual preview of Polly Findlay’s production, the first two having been cancelled. It interests me how Macbeth, one of the easiest and most straightforward of Shakespeare’s plays to mount, unleashes a considerable amount of creativity and innovation from director and designer. Take, for example, the Old Vic production where Peter O’Toole exited backwards and knocked the set down. Or Mark Rylance’s Greenwich Theatre production when Macbeth and Banquo travelled across Scotland in a stationary half car and when Lady Macbeth weed on stage and her gentlewoman mopped it up with kitchen roll, provoking prolonged hysterical laughter from the teenagers studying the play for GCSE. Or even Stratford’s production when the witches became Macduff’s children and when Jonathan Slinger as Macbeth prepared for battle at the top of a stepladder on a bare stage. This production also has a range of creative and innovative features which are just as effective as in those three productions I have just mentioned. Designer Fly Davis has created a large rectangular stage with a walkway round it where actors can perambulate without having to sully the huge main bare area. The opening is remarkable: an old man is in his bed and there are three little girls in their Christmas pyjamas sitting miles apart from each other, each fiddling with her teddy bear as well as another character who turns out to be female when she stands up sitting facing away from the bed doing nothing. Upstage right is a person who looks homeless sitting on a chair. He remains when the bed is pushed off for the next scene. Who are they, one asks oneself? Later we learn unsurprisingly that the old man is Duncan. Surprisingly the little girls are the witches who eventually speak, in chorus, miked with an echo chamber, a few of the lines which Shakespeare wrote for them. The female turns out to be someone’s wife (if she is Duncan’s daughter in law why does she completely ignore him?) and the homeless man is the Porter/Old Man/Seyton (all in the same clothes so it is obviously not an actor playing three parts although he has three different accents). Another masterstroke is the digital clock with red numbers which counts the time down to Macbeth’s death in real time, often prompting audience members to realise how incredibly slowly time can go when you’re not having fun and when all you want is a glass of wine. Innovative, too, are the projections, mainly rather random although always portentous quotations from the play except for the most commonly shown one, “Later” which might be helpful to those members of the audience too bemused by what they are seeing to realise that the play is a chronological narrative. The technical problem of the ‘line of kings’, obviously much too demanding to realise on stage, is shown by means of a blurry and dimly lit film projection. I was just glad that the clock didn’t show that we historically had to wait fifteen years for Macbeth to die. Two levels were used, too. So that the main large stage could remain as empty as possible for as much of the time as possible, Polly Findlay placed a social group on an upstage balcony, suggesting social interactions but economising on props and on bringing things on and off stage. Nothing significant happened up there but it provided a welcome distraction from the ‘sawing the air’ happening down below. Unusual decisions have also been taken in the acting department. Because so many of the scenes and speeches have been cut in length there aren’t many words left to fill the advertised two hours and five minutes and so the unusual decision has been made to have what remains delivered very, very slowly. This should ensure that every word can be heard and pondered on in isolation. Unfortunately the actors’ articulation at the first preview was so poor that there were only three actors whose every word could be heard. I don’t think that this was a conscious decision. Although the effect was in keeping with the mildly surrealistic nature of the whole, I think it was incompetence. Another extraordinary decision was to have a great deal of crouching in the production and to characterise Lady Macbeth by manic rushing about in her early scenes (once she had read her husband’s letter while sitting upstage next to the homeless person). There was much flailing of the arms, too, such as pointing exaggeratedly to where something might be happening. Stevie Basaula as the Bloody Captain managed to amalgamate all these extraordinary acting decisions by not only emphasising every word (sometimes every syllable) but accompanying each with a kind of nodding gesture. I had never seen this technique used in professional theatre before. I had also never seen a battle staged like this before. Macbeth and Macduff were alone on a bare stage waving a sword apparently randomly, sometimes near each other. Another surreal scene, I suppose. Underwhelming, though. Christopher Ecclestone plays Macbeth. My partner thought that he displayed inner turmoil. I didn’t get it. You could hear what he said (or sometimes shouted), however. Niamh Cusack plays Lady Macbeth. Bally Gill as Ross and Tim Samuels both had moments where what they did and said made sense. Other people played the other characters. I felt sorry for Michael Hodgson as the Porter and others. He walked about a bit in the Porter scene but had to watch the whole thing, mainly sitting down except when he was turning a light on or off. Come and have an enjoyable stay in Stratford. 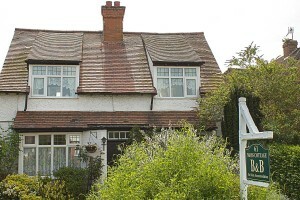 You will have a warm welcome at Moss Cottage if you decide to stay the night. And in the evening you can go and see a play in the Swan Theatre or at the lesser known Attic Theatre or Bear Bit theatre. I saw the production last night & I think your review is far too kind.